How to watch Oggy and the Cockroaches: Season 4 (2017) on Netflix Austria! Sorry, Oggy and the Cockroaches: Season 4 is not available on Austrian Netflix, but you can unlock it right now in Austria and start watching! With a few simple steps you can change your Netflix region to a country like France and start watching French Netflix, which includes Oggy and the Cockroaches: Season 4. We'll keep checking Netflix Austria for Oggy and the Cockroaches: Season 4, and this page will be updated with any changes. Oggy and the Cockroaches: Season 4 is not available in Austria BUT it can be unlocked and viewed! Wimpy blue cat Oggy would like nothing more than to snooze, but he's constantly bothered by the three ugly cockroaches who have invaded his home. Most people don't like roaches, and neither does this cat! He wants to be left alone, but the bugs have other plans. Season 4 of Oggy and the Cockroaches has 40 episodes. Because different Netflix countries have different availability for episodes, you'll need to check the episode listing below to see which are available in Austria. Olivia / Dee Dee's Diet / The Lighthouse Keeper / Dump the Roaches! Oggy loves his new neighbor, Olivia; Dee Dee is on a diet; Oggy and Jack become lighthouse keepers for a day; Oggy and Jack find jobs as garbagemen. Oggy gets chocolates for his birthday. / The roaches take over Jack's brain. / The roaches steal Oggy's fries. / Oggy puts a lock on the fridge. The roaches take a nap in the CD player. / Jack gets a cold. / The roaches overfill Oggy's coffee maker. / Jack is building a skyscraper. Joey's fake photos make Oggy jealous; hundreds of cockroaches attend Joey's birthday party; Oggy's laundry is a joke; Oggy's parrot is trouble. Oggy orders a remote control panic room kit; cockroaches float the house with helium balloons; a cube takes over Oggy's life; Oggy finds a helicopter. The roaches take the key to Oggy's fridge. / Jack organizes a birthday party for Oggy. / Oggy is transformed into a giant roach. / Oggy falls in love. Oggy breaks his mirror. / Jack asks Oggy to hold on to a case filled with money. / Oggy loses a baby tooth. / The roaches hijack Oggy's toy train. Oggy's shadow goes missing; Oggy and Jack run Corsica's GR 20; the cockroaches try to stop Oggy from fixing a car; Olivia takes Oggy to a farm. Oggy makes a remote control for his lawn mower. / Oggy discovers that his stomach is huge. / Oggy takes his driving test. / A mouse raids Oggy's food. A magic pencil makes drawings that become real; Oggy's parents visit; the house is launched into space; cockroaches perform Olympic sports for Oggy. Oggy plays with his doll. / Oggy catches the roaches in an empty can. / Oggy sets up to spy on the roaches. / Oggy awakens to a cry for help. Jack gives Oggy romantic advice; Olivia runs a marathon; an Easter bunny lays an egg; Oggy finds a butterfly that enchants Olivia. Oggy takes in a stray dog. / Jack takes Oggy fishing. / Oggy and Jack take off in a plane. / Jack and Oggy go to dinner in the city. Olivia skates in Oggy's ice rink; Marky turns into a hungry giant; Oggy becomes a taxi driver, but the cockroaches sabotage him; Oggy paints. Oggy decides to go on a diet. / Jack wants to take Oggy rock climbing. / The roaches steal Jack's cake. / Jack and Oggy win the lottery. Oggy and Joey electrocute themselves; Oggy spends time with his nephew; Oggy can't find his way home; Oggy uses a five-legged sheep to cut the grass. The cockroaches spike Oggy's veggie drink and make him invisible; Jack goes to the cat show; Oggy buys Olivia caviar; Oggy finds a skateboard. DeeDee falls into a yogurt container. / The roaches lock Oggy out of the bathroom. / Oggy catches the roaches red-handed. / Oggy and Jack go fishing. Oggy has a bad case of the hiccups. / Oggy needs to take a bath. / Extraterrestrial cockroaches invade the kitchen. / It's Oggy's Granny's birthday. Oggy buys a magic smile; Oggy and Joey fall to the center of the Earth; Oggy finds a seemingly extinct bird; Oggy buys a teleportation machine. Halloween gets scary; sharing is caring, but not always fun; the group celebrates the Tour de France; Olivia won't leave home. Jack starts acting like a dictator. / Oggy finds some old love letters. / The roaches play with Jack's brain. / Jack tries to assemble a roach trap. Oggy goes to the carnival. / Oggy brings home a snail. / Oggy decides to make a documentary about the roaches. / Dee Dee gets struck by lightning. Jack and Bob crash Oggy's party for Olivia; Oggy seeks a roommate; the cockroaches wreak havoc with a spray bottle; Oggy installs a solar panel. Jack decides to give Oggy's house a makeover. / Oggy tries to escape a pesky cloud. / Jack and Oggy catch a duck. / Oggy tries to make a magic flute. Lady K / The Bathtub Race / Inspector Dee Dee / Steamed Out! Cockroaches attack Olivia's house; Olivia holds a Bathtub Derby; Oggy's house is robbed; to lose weight, Oggy, Jack and Bob build a steam room. A turkey finds its way into Oggy's yard. / Oggy is scared as he watches a horror movie on TV. / Oggy and Jack play chess. / Oggy gets a new toy. Oggy bakes a cake; Bob blocks Oggy's sun when he builds a high-rise hotel; a snowstorm causes trouble; Oggy, Jack and Olivia visit a water park. Jack takes Oggy camping. / Oggy puts a lock on the fridge. / Oggy throws the roaches out on Christmas Eve. / The roaches find one of Oggy's costumes. Oggy tries to propose to Olivia in Venice, but events conspire against him; Oggy and Olivia go camping; Oggy has a dream about winning the lottery. Oggy is hypnotized by TV. / Jack and Oggy race their remote-controlled cars. / Oggy is scared by a horror show. / The roaches overfertilize the yard. The Cucaracha / Shoplifting / Picnic Panic / Wrestling Time! Joey's Mexican cousin visits; cockroaches rob a store at Lady K's request; Oggy, Olivia and Jack go on a picnic; Jack trains Oggy in wrestling. Olivia rescues Santa from the cockroaches; Oggy sees a mermaid; cockroaches trick Olivia with a poison apple and Oggy becomes her Prince Charming. The roaches get caught in a trap. / Jack is taking Oggy to the seaside. / Jack creates an insecticide that goes wrong. / Oggy finds a genie. A witch's hat falls in Oggy's garden and the witch turns the men into animals; Oggy works in a restaurant; Jack drives a tram into a chemical plant. Oggy and Joey get sucked into the electrical system. / A hungry moth invades Oggy's house. / Oggy is catnapped. / Jack headlines at the opera. Oggy Splits Hairs / From Mumbai with Love / Don't Barge In! Cockroaches sabotage Oggy and Jack's hair salon; Jack invites Olivia and Oggy to the cricket finals in India; Oggy and Olivia take a barge ride. Joey falls in love with a little bee. / Oggy goes to the seaside on his scooter. / Jack and Oggy ride in a hot-air balloon. / Oggy is in the hospital. When the lights go out during a card game, a battle with cockroaches ensues; Oggy and Jack must deliver packages, but the cockroaches impede success. Oggy encounters a witch with a magic broom. / Oggy discovers a strange gun in the attic. 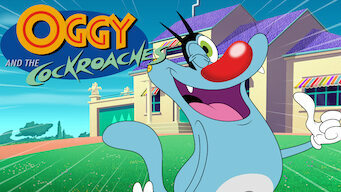 Season 5 of Oggy and the Cockroaches has 26 episodes. Because different Netflix countries have different availability for episodes, you'll need to check the episode listing below to see which are available in Austria. Oggy and the cockroaches get lost in a pyramid; Oggy's whistle attracts invading grasshoppers; Oggy and Olivia's cruise on the Nile takes a turn. When Oggy is accidentally enlisted as a gladiator, Olivia must save the day; Jack gives Oggy chariot lessons; Oggy tries to survive a day at the spa. Joey, Jack and Oggy compete in a rootin'-tootin' rodeo; Sheriff Oggy tries to maintain law and order; A bounty hunter mistakes Oggy for a fugitive. Oggy's time at Versailles has a rocky start; Oggy must drive the royal carriage to the palace; Oggy helps Jack prepare the king for his portrait. Jack joins Oggy for a fierce medieval tournament; Lord Bob leaves Oggy and Jack in charge of the castle; Oggy crosses paths with Quasimodo. Jack brings a giant gorilla to Broadway; Oggy and Joey battle over flowers in old New York; Dee Dee competes with Al Capone. Oggy the cabin boy and Jack the pirate race the cockroaches for treasure; Olivia's new medallion conjures a genie-like octopus. Oggy adopts an adorable but destructive panda; Oggy and Jack try to repair a vase with no help from the cockroaches; Oggy babysits for the emperor. Oggy the elephant driver embarks on a tiger hunt; Oggy searches for a way to meet the maharajah’s daughter; Jack accidentally invents a popular game. Oggy and the cockroaches grow attached to a baby dragon; Oggy volunteers for the Viking chief's dangerous mission; Oggy discovers Thor's secret fear. Aladdin helps Oggy rescue Olivia the princess with an assist from the genie; Oggy and the cockroaches find the genie in the carpet store. Oggy and company film their trip to space; Oggy and the cockroaches join Charles Lindbergh on his famous flight; Oggy has a brilliant idea. Joey uses fake eclipses to become a village's leader; The cockroaches team up with a conquistador; Oggy has remorse about not helping the cockroaches. Oggy's ring goes overboard -- and so do the cockroaches; A wrong turn leads to a walk on the moon; Jack races to be first to the North Pole. In Venice, Jack falls head over paws in love; Oggy's up to his eyeballs in confetti; When it comes to art, Oggy's no da Vinci. Oggy does his best Napoleon impression; Oggy solves the mystery of Napoleon's famous pose; Oggy makes an epic discovery on an archaeological dig. Jack and Oggy manage a rest area in Mongolia; A milk shortage forces Oggy to think outside the yak; Olivia competes for Best Yak Handler. The cockroaches run wild on Oggy's spaceship; Oggy's refrigerator has unwelcome visitors; Oggy and Olivia check out a chicken-shaped spacecraft. Jack trains Oggy to be his replacement samurai; Oggy looks to settle a conflict in the sumo ring; Bored with his job, Oggy takes to drawing. Oggy invents paint to help plan hunting expeditions; Oggy's on a roll when he creates the wheel; Oggy and Jack search for a new cave-home. Oggy, Jack, Olivia and Bob score superpowers; Oggy's new flying suit inspires jealousy; It's up to the Z-Men to put the cockroaches back behind bars. Oggy and the cockroaches run rampant through Zeus's palace; Zeus pawns his housework off on Oggy; The cockroaches prove themselves to be poor tailors. Oggy becomes the object of Circe's affection; An angry Poseidon sends Oggy toward Cyclops Island; A wacky compass takes Oggy's ship off course. Jack and Oggy are ordered to build a temple; Oggy stumbles upon a lost child; the cockroaches use statues to gain control of Oggy's house. The cockroaches scare away an important tree; Oggy's voice makes it rain until Joey steps in; Oggy asks a genie for help with the cockroaches. Oggy finds a sword stuck in a stone and meets Merlin; The chase is on to find a mystical treasure; Merlin's magical rival makes her presence known. Season 4 of Oggy and the Cockroaches has 0 episodes. Because different Netflix countries have different availability for episodes, you'll need to check the episode listing below to see which are available in Austria.